GRAMMy is a computational framework developed for Genome Relative Abundance using Mixture Model theory (GRAMMy) based estimation. Accurate estimation of microbial community composition based on metagenomic sequencing data is fundamental for metagenomics analysis. Prevalent estimation methods are mainly based on directly summarizing alignment results or its variants; often result in biased and/or unstable estimates. We developed the Genome Relative Abundance using Mixture Model theory (GRAMMy) approach estimate genome relative abundance based on shotgun reads. GRAMMy has been demonstrated to give estimates that are accurate and robust across both simulated and real read benchmark datasets. Figure 1. The GRAMMy model. 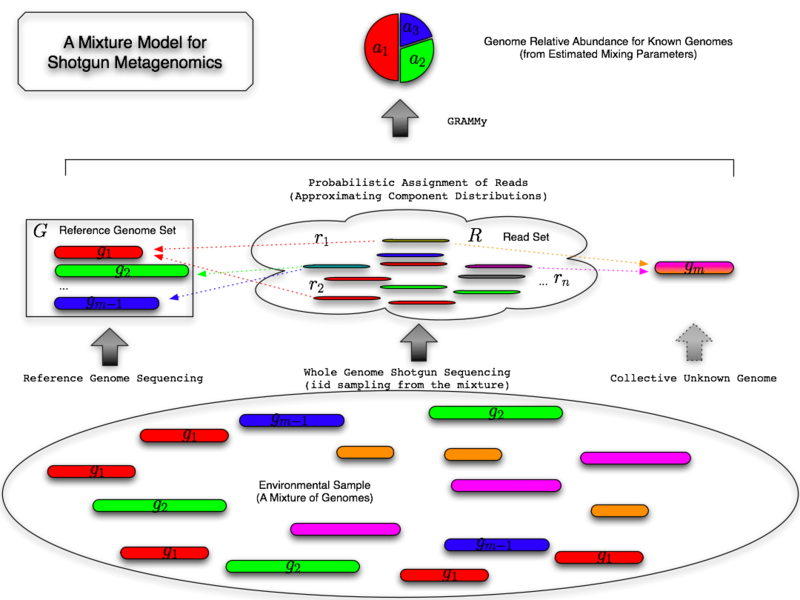 A schematic diagram of the finite mixture model underlies the GRAMMy framework for shotgun metagenomics. Genome Relative Abundance using Mixture Model thoery (GRAMMy). Currently the package works for Linux (Ubuntu) platforms. It might work for Windows with Cygwin and Mac with Xcode and Mac ports (not tested). It requires the Standard C++ Library with Technical Draft One. A Dockerfile is provided to build elsa enabled docker image from a standard Ubuntu docker image. Please fullfill the prerequisites of C++, Python (with development and setuptools), numpy, scipy and biopython as described in README.txt before installing GRAMMy. Above executables will be available from your python scripts directory. Use '-h' to read individual script usage. A simple test example is available at 'test/test.sh' and explained with in. GRAMMy's https://bitbucket.org/charade/grammy/wiki/ page is an growing resource for manuals, FAQs and other information. This is a MUST read place before you actually using the GRAMMy tool. These documentations are also openly editable. You are more than welcome to contribute to this ongoing documentation. Questions and comments shall be addressed to fsun@usc.edu and l.c.xia@stanford.edu.